I’ve visited Waikiki Beach multiple times over ten years and every year the erosion gets worse. Sometimes subtle, but I do notice the changes. 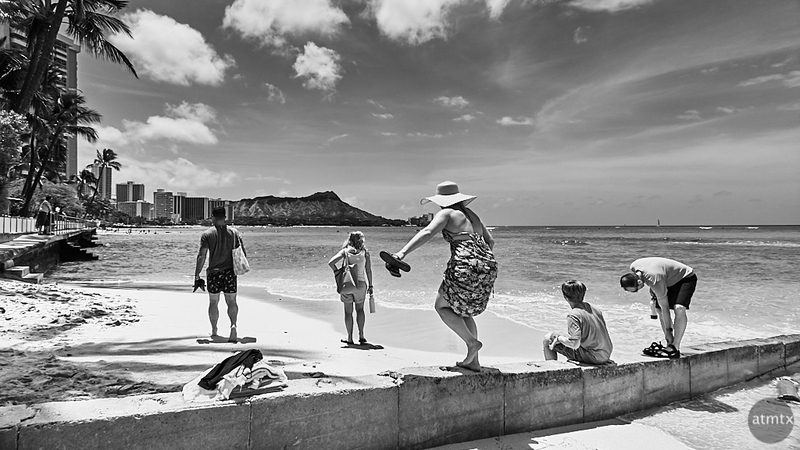 There are stretches of Waikiki where you can no longer walk completely on the beach and requires walking on a concrete walkway a top a wall. I’m not sure if it’s due to the natural forces of erosion, climate change or both. Ironically, the most fancy property on Waikiki Beach, the Halekulani, has the worst beach. Well, actually no beach at all. You might be able to make out the walkway, with iron railing, on the left side of this photo. That’s what you have left. I heard that in a recent winter storm, the waves were washing over the wall and into the property. The Sheraton, next door, unceremoniously has boards placed to block some of the water. I get a feeling that nature will always win. Wow, I know exactly where this was taken and you’re right the beach is gone. It was 2005 when I was there, and the beach was way out there. I would have to look for my photos. This is a very cool image. It could have been taken in the 60’s, even the 50’s. Thank you, Brett. I guess it does have a timeless look. I’m curious if you find your photo. Yes. Thanks for your visit and comment.